Any head injury to the brain, skull, and scalp is considered a head injury. The brain is very sensible and can receive several types of brain injury, depending on the amount of force that impacts the head. 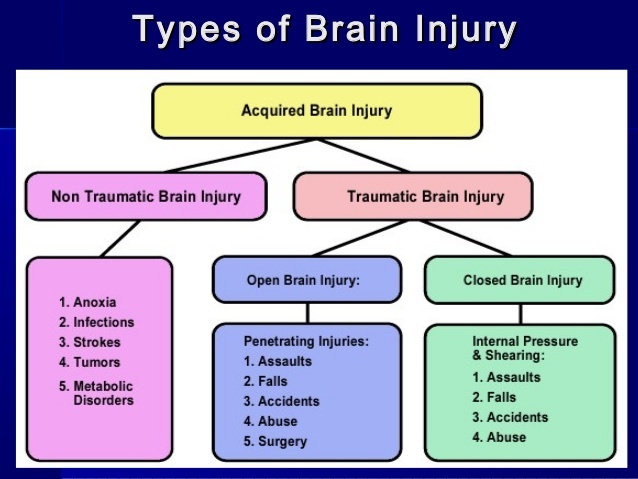 The injury to the brain can affect one or more functional areas of your brain, as you can see in the chart above, courtesy of Brain Injury Association of Massachuttes. In this article, you will learn about brain injuries and who may be responsible for your accident. For more information about the effects of a brain injury, check out the website of BIAMA. Any damage to the brain that results in an impairment of physical, cognitive, behavioral and speech/language functioning is considered a brain injury. The damage can be the result of external physical force, toxic substances, insufficient blood supply, congenital disorders, birth trauma, degenerative processes, and malignancy. You could suffer from a concussion when the brain experiences trauma from an impact and a sudden change of movement. The blood vessels in the brain can stretch, and the cranial nerves can suffer damage. A contusion is a bruise on the brain (bleeding). This can be the direct impact to the head. This condition may require surgery to remove extensive contusions. This injury describes contusions located in the impact zone and on the opposite side of the brain. It is the result of the brain slamming into the other side of the skull. This injury is caused by the strong rotation or shaking of the head, or by rotational forces, like the ones from a car accident. A person suffering from diffuse axonal injury could suffer from a variety of functional impairments. According to the brain injury law, a traumatic brain injury is defined as damage to the living brain tissue by external mechanical motions or forces. It is common for people suffering from this to have periods of amnesia or coma that are either very long (months-permanent) or only very short (minutes). It is important to act fast and consult with a brain injury lawyer from Maryland to formulate a strategy against the person responsible. Electric shock, kidney/heart failure, drug overdose, near-drowning, and chemical exposure can be the causes this condition. The body responds to the cerebral anoxia by increasing the blood flow to the brain and attempting to restore the normal level of oxygen. But this flow can only be increased by twice the average level. If the change is not enough to compensate for the anoxia, the brain function will be disturbed, and you will suffer from apparent symptoms. This disorder is in itself a broad category. It includes neurological disorders and acquired brain injuries, resulted from in trauma and disruption of the brain and nervous system. This is a violent criminal act that causes traumatic brain injuries. It happens when the perpetrator aggressively shakes a young child or a baby. The whiplash-like motion will cause the brain to be injured. In the case of an accident, the person responsible for your brain injury is the one that caused it or was negligent and favored the accident to happen. If you want to find the responsible party and build a powerful brain injury claim in MD, it is recommended to hire a brain injury attorney from Annapolis. Luckily, some of the brain injuries can be resolved with traumatic brain injury rehabilitation in Maryland, but the therapy can cost a lot of time and money. For this, a brain injury attorney from Annapolis will strategize to build a substantial brain injury claim in MD so that you can receive compensation. The compensation may include the money you or your loved one has lost because they were unable to work, the money spent on the traumatic brain injury rehabilitation in Maryland, and financial compensation for the emotional distress. Contact the best brain injury lawyer from Maryland at (443) 569-3950 or email us at [email protected]. You will receive a free consultation of your case. With the brain injury law of Maryland and the best team of attorneys, you can receive the compensation you deserve for the brain injuries you or your loved one has suffered.